As many of you know, Jax and I spent Summer Solstice, also known as Midsummer, in my back yard. It was just us princesses, so our observance was intimate and personal. * We shared and offered a meal with wine. It was a lovely affair and I was glad to share it with one of my dearest friends. The “main event” of our blót was to construct something, then offer it to the gods. This offering is usually made through fire, but since there is a burn ban in our area, we did not create a flameble gift. 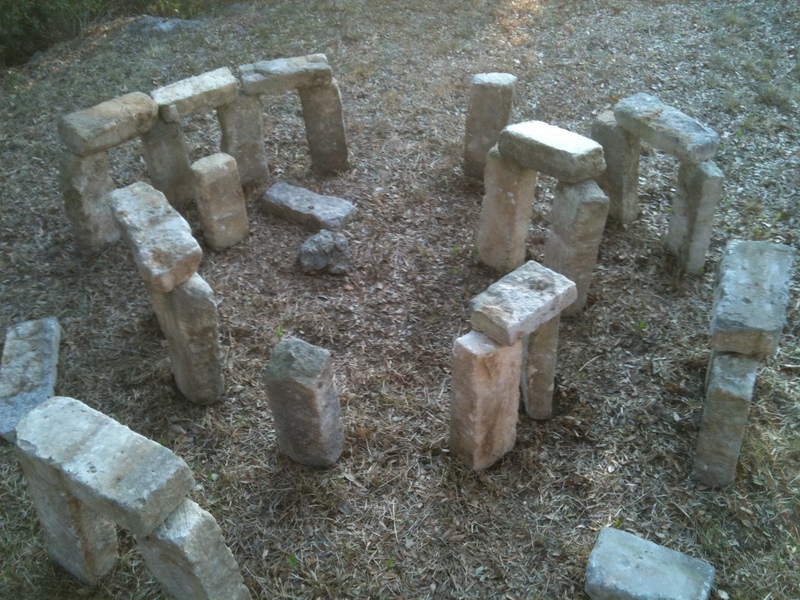 Instead, my thought was to use landscaping stones to build a miniature version of Stonehenge…a Minihenge, if you will. To plan for this, I asked the Oracle for pictures of Stonehenge taken at angles that would help me map the stones. I had a lot of trouble finding good shots. I ended up using a site called “How to build a model Stonehenge” … for a pet lizard, tarantula etc. I don’t know why, but this totally cracks me up. I also hoped to have a maypole, which is common at Midsummer blóts. Rather than buy material for ribbons, I found an old white sheet and cut that into strips. I dyed half of them green and left the other half white. I had a pretty straight tree in my back yard and I thought it would serve as a decent pole. This plan had to be modified, since it was just me and Jax. A maypole with two people would be sparse, at best. But I still wanted to include some element of this symbol, with pretty ribbons that would fly in the wind and add color to our observance. 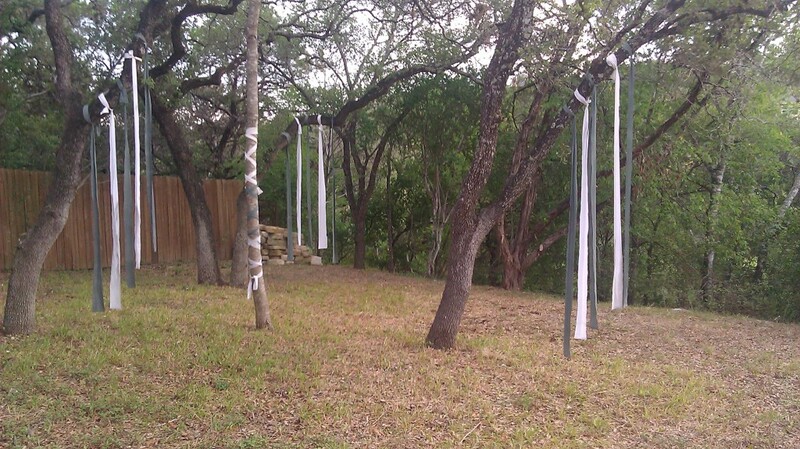 So, I tied the ribbons to trees and created three “curtains” in my backyard. I talked about why I chose Stonehenge as our offering project in a previous post. Basically, I think Stonehenge is freaking awesome and I wanted one in my back yard, even if just for a little while. Thank goodness Jax was there to help me build it. Those $@#&ing stones were heavy! We used our “lizard-inspired” map and took turns carrying stones and placing them in the ground. Our Minihenge wasn’t an exact replica, but it was close enough. And I think it was pretty cool. We stood inside Minihenge and invited our ancestors and our gods to the blót. For my family, I invited my father, my maternal grandmother and my paternal grandfather. ** I’ve been feeling the need for familial backup lately, so I called down those I considered FtbRWs (forces to be reckoned with) when they were alive. For the gods, I invited Baldur, because his death is symbolic of the death of the sun and the rise of a new cycle. I also invited Thor, as Jax and I contemplated cycles of our own. Thor represents fertility, and Jax and I are both thinking about (and hoping for) motherhood. For her family, Jax invited her father’s mother and her mother’s father and her ancestors in general. She also invited Frigg and Ole’ One Eye himself. After this, Jax and I thought about what we wanted for the next year and made a silent wish as we passed through each of the three ribbon curtains. Then we got out of the heat and dined on Tilapia and asparagus and talked until we finished the wine. All in all, it was a great night. Minihenge stood for all of the blót and most of the night, until the wind that accompanied a much needed rain knocked most of it down. Most of the ribbons staying in the trees, but the green ribbons dripped onto the white ones in the rain. Still, it was a lovely sight to wake up to the next morning. 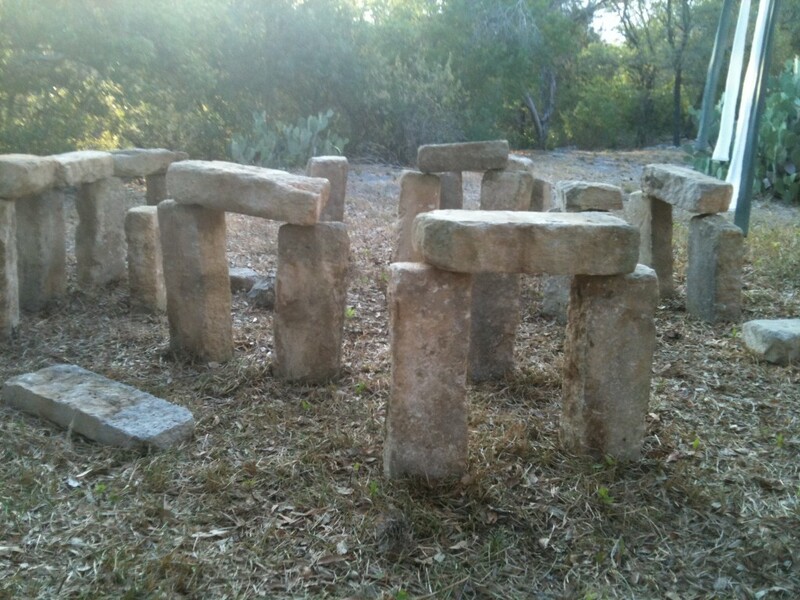 I took down minihenge the next night by myself — as was the intention. Taking them down was easier than putting them up, because it didn’t require thought. I saved the ribbons in case we want to offer them at the end of the harvest season (called Winter Nights by Heathens and Samhain by many other pagans). 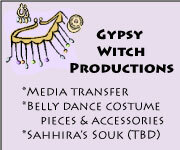 *** It was a lot of work, but well worth it, for the symbolism and the ritual act. What say you realm? How was your Midsummer? * Many thanks to B, Mr. B and Chris for trying to make it out. Maybe next time!! *** Another pagan suggested we burn the ribbons at Winter Nights. I can’t find anything that authenticates this practice, but it sounds like a neat idea. In fact, I think I’d rather wait until Yule and offer the ribbons then, instead. Maybe Jax and I will share our wishes aloud then. Fantastic pics! I love the filtered sunlight in the composition. Thanks, B! Jax took the Minihenge pictures. She deserved credit for the cool composition. That is so very….amazing! Too bad you didn’t leave it standing. What a cool place to go to do some mind clearing.